Single outlet to run one hose or watering tool. Single outlet to run one hose or watering tool. Automatically shuts water off when you want it to, no batteries required. Gilmour's products are simple and intuitive—they’re easy to operate and designed to feel natural in your hand. For carefree performance, Gilmour's products work together seamlessly and provide secure connections that minimize leaks and wasted water. Easy to read LCD screen. Unique- runs up to 360 minutes. Valve closes if battery is low. Manual on/off. It is available in blue. Make the perfect choice for your irrigation system with this efficient product. Type of Lawn & Garden Tool: Watering tool. Easy to set and use, no tools needed. Single outlet to run one hose or watering tool. Schedule only the watering your lawn and garden needs with a quick-set-up, programmable display. One of them has the filter screen pushed in slightly (see pic) but will not effect its operation. You must research it yourself and make sure this item will work for you. See pics for more information and details. Item model number: 100517121. Automatically shuts water off when you want it to, no batteries required. Single outlet to run one hose or watering tool. Manufacturer: Robert Bosch Tool Corporation-Water Gardening. 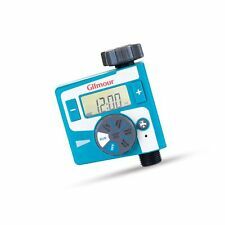 Gilmour Mechanical Water Timer Condition is New. Shipped with USPS First Class Package. Simple to set up and easy to use all season long. Large, easy-to-read LCD display makes programming a breeze. Rain Delay feature pauses watering schedules to prevent unnecessary watering. Batteries not included, requiers 2AA batteries. New in box. Box has been taped closed. New, open box. Unit is in very good condition. Full flow outlet for more sprinkler performance. Swivel nut for easy connection. Rubber overmold dial for better gripping. Easy to read top-view settings. Manual on/off. Works with "My Design" sprinkler kits. Simple to set up and easy to use all season long. Large, easy-to-read LCD display makes programming a breeze. Saves both water and money. Easy to set and use, no tools needed. Helpful Links. Requires 2 "AA" batteries not included. 1-360 minutes. Single outlet. Schedule only the watering your lawn and garden needs with a quick-set-up, programmable display. Large, easy to read LCD. Automatically turns water on and off. Valve closes if battery is low and will not open. Full flow outlet for more sprinkler performance. Swivel nut for easy connection. Rubber overmold dial for better gripping. Easy to read top-view settings. Manual on/off. Not for use with hot water. IMPORTANT: BASED ON VISUAL INSPECTION THIS ITEM APPEARS TO BE USED. WE VISUALLY INSPECTED IT, BUT WE ARE NOT SURE IF IT WORKS OR IF IT'S COMPLETE. Item shows signs of previous use. Swivel nut for easy connection. Works with My Design sprinkler kits. Not for use with hot water. Manual on/off. Full flow outlet for more sprinkler performance. Rubber overmold dial for better gripping. Trending at $14.08eBay determines this price through a machine learned model of the product's sale prices within the last 90 days. Gilmour 9301 Mechanical Water Timer NWT!! 2min-120min. New in package!! Send message with questions. I usually reply within a few hours. Durable Sprinkler Head of Brass & Zinc. Standard 1/2" NPT Connection. Easy to set. manual on/off button for instant watering. safeguard valve closed if battery is low. BRAND NEW UNOPENED PACKAGE. GARDEN HOSE TIMER WITH AUTO SHUT OFF. 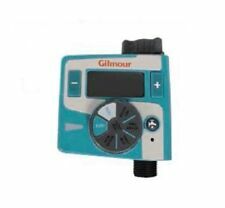 Gilmour Digital Programmable Automatic Water Timer Single Outlet NEW . Condition is New. Shipped with USPS First Class Package. Automatically shuts water off when you want it to, no batteries required. Automatically turns water off. MODEL NUMBER 167H. GILMOUR SPRINKLER HEAD. Provides full or partial coverage. Long lasting brass and zinc construction. Impulse arm saves water by eliminating back and side splash. Light modest wear due to being a display item from a trade show convention. 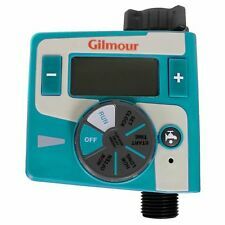 Gilmour Digital Programmable Automatic Water Timer Single Outlet NEW . Condition is New. Shipped with USPS Parcel Select Ground.